Since autumn 2013, the University of Leicester Medical School has been issuing each first-year undergraduate with an iPad. This is the first UK medical school to implement this kind of initiative. Why did we do this? One of the main drivers was to solve the problem of having to print paper workbooks, which cost too much and then constantly need to be updated. Our solution was to simply format the workbooks into a nice shape for the full-size iPad, save as pdf, and distribute to the students via Blackboard. We then instructed the students to buy Notability (an app which reads pdfs and allows note-taking) and download the Dropbox cloud storage app, which works together with Notability and many other apps. We also instructed the students to bring their iPads to every class session. And then we watched what happened! 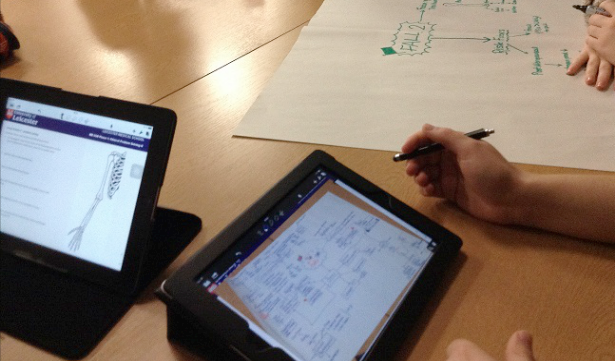 By their own report in several surveys, the students mainly used the iPads to read and annotate their workbooks, and to follow along in lectures, annotating onto pdf lecture slides. But it was beyond that use where things got interesting. Students worked together in small group sessions, discussing and drawing on paper, then at the end of the session photographing their notes and developing them individually later in personal study. Students created study groups on Facebook and shared documents and discussed. Students created flashcards of the names of muscles, for example, and tested their knowledge personally and in groups. Below is a list of apps which students mentioned in a survey, which they found useful, along with a brief description of what the app does or how students reported using it. After that is a further brief list of reported learning activities with their iPads. I hope to report further developments on this initiative as it matures.